Hip-hip-hooray! We finished the master bath remodel! 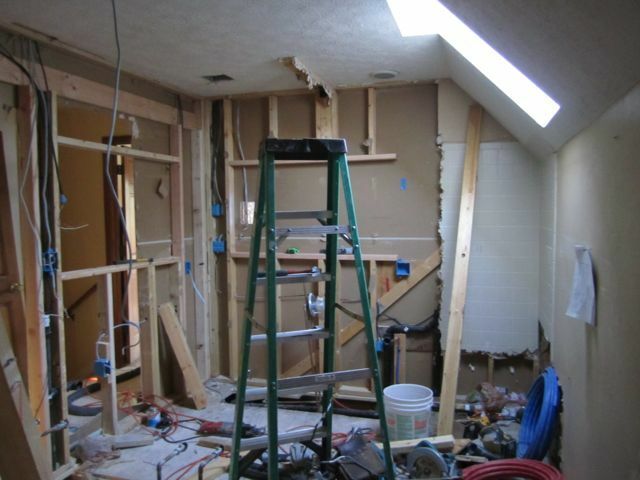 By taking out an old closet in the master bedroom we increased the footprint of our master bath and upgraded everything in it. 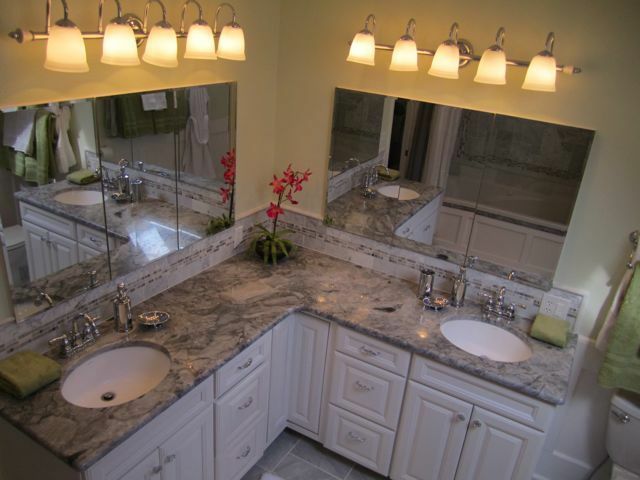 Our double vanity features new “super white” granite countertops, dual 4′ medicine cabinets, new cabinetry, and marble tile backsplash. We also now have a 6′ jetted tub with an in-line heater, custom marble tile surround, upgraded massaging shower with hand held shower feature and custom niche. We added storage via a 3′ deep storage closet and upgraded to an ultra quiet and powerful bath fan and new can lighting on dimmers. 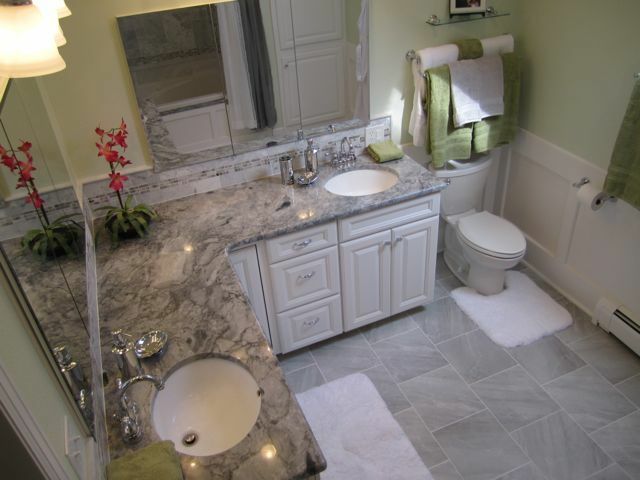 Double towel bars, a glass shelf, and custom wainscoting on the wall and tub complete the look. Another view from above – here you can see the detail on the Super White granite countertop. I actually learned how to cut tile on this project and installed the backsplash with some help from our contractor. 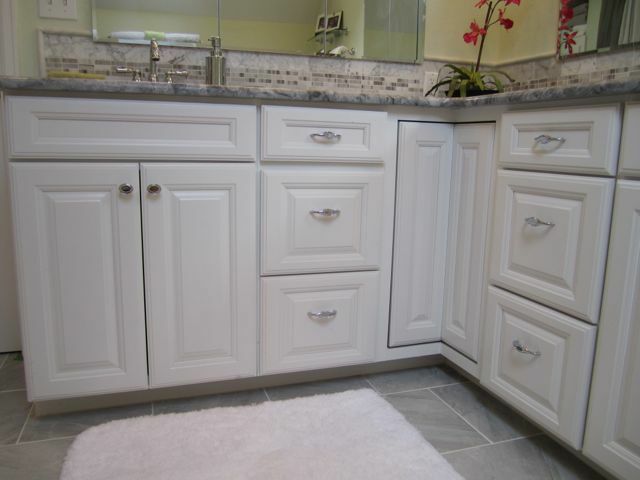 The cabinets are from Aristokraft and are a painted white finish. I was especially excited to find the corner lazy suzan unit for extra storage. The marble accent tile is from Lowe’s. The paint color is called “Botanical Bath” and is made by Valspar. 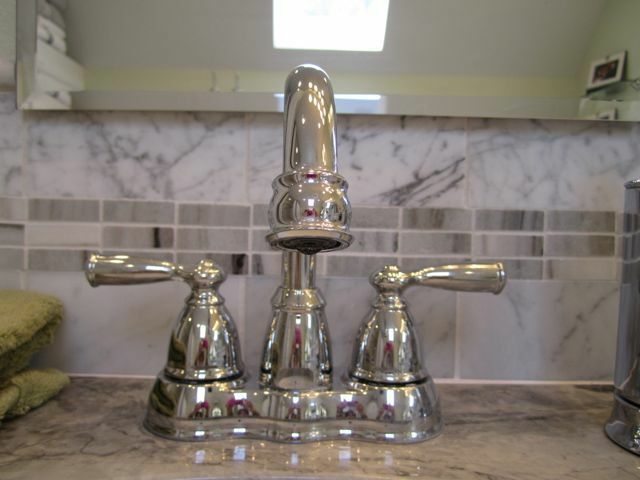 This is a Moen Banbury faucet. It’s gooseneck shape accommodates taller vessels and the faucet pivots. This view also gives you a closeup of the marble tile backsplash. 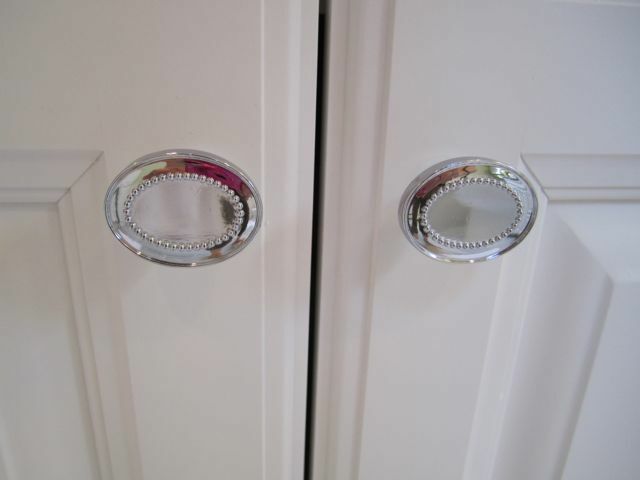 These chrome knobs and the matching pulls are from Lowe’s. This is a view as you walk into the room. 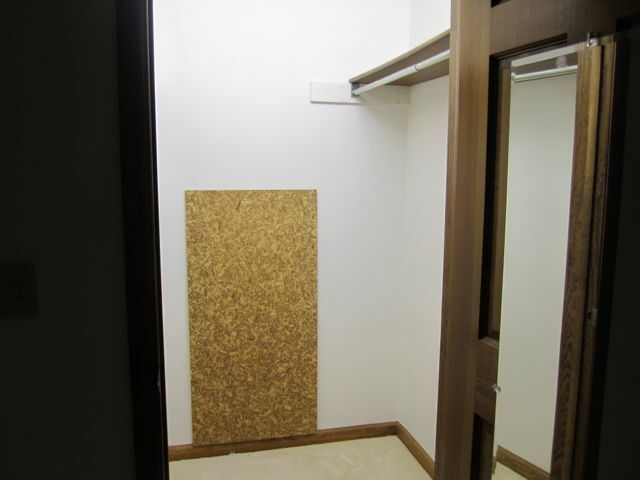 The entire room was retextured and painted giving the sky light a brand new appearance. One of the biggest challenges in designing this space is the far-side wall that sharply slopes from 8′ to 5′ 9″. The entire floor plan of the bath room was planned in a way to maximize use of space but prevent putting the vanities or shower surround on the short wall. The 4′ medicine cabinets and double towel bars are from Home Depot. The chrome soap dispensers and accessories are from Lowe’s. 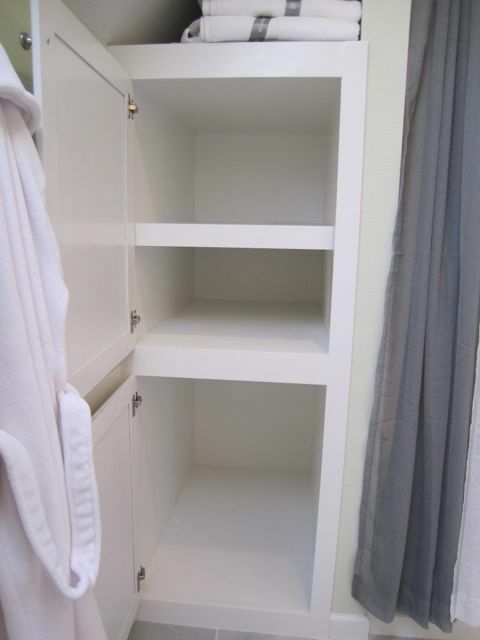 Our new linen closet was custom made for the space – it is three feet deep and the bottom section is tall enough to house two laundry baskets – perfect for hiding dirty laundry. I opted for grey and white sheer panels and a shower curtain for the tub/shower enclosure instead of glass. This enables us to sit on the ledge of the tub and gives a better view to the sky light from the reclining position in the tub. 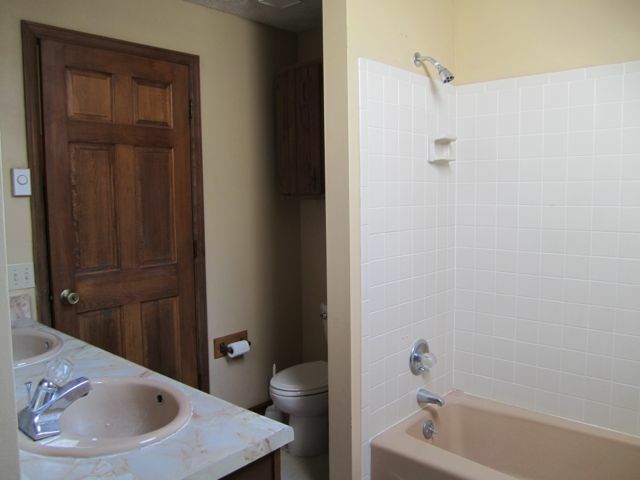 The tub wall has wainscoting to match the back wall of the bathroom. The cabinets are from Aristokraft and are full-overlay, raised panel, and painted white. This version of cabinetry is called Briarcliff. It is best to plan as much as you can with room for flexibility. 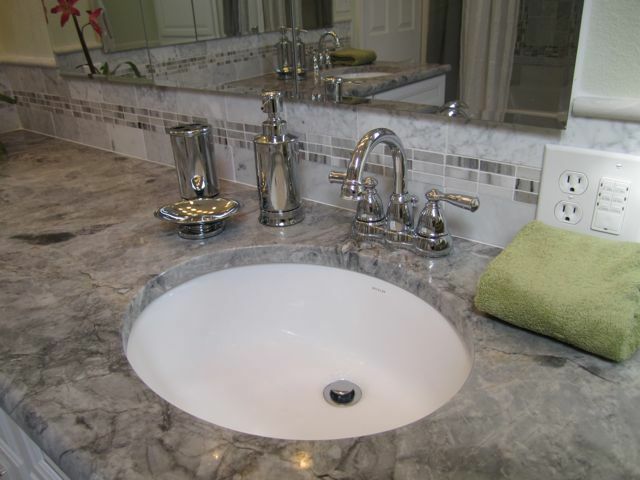 Fixtures or tile might be unavailable so you need to leave room for changes. 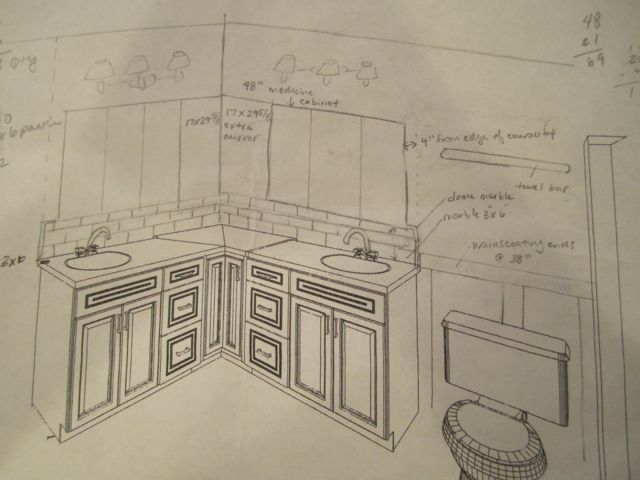 I started my planning with the cabinet reseller since cabinetry is a long-lead item. Using cabinet placement I was able to design the rest of the bathroom. 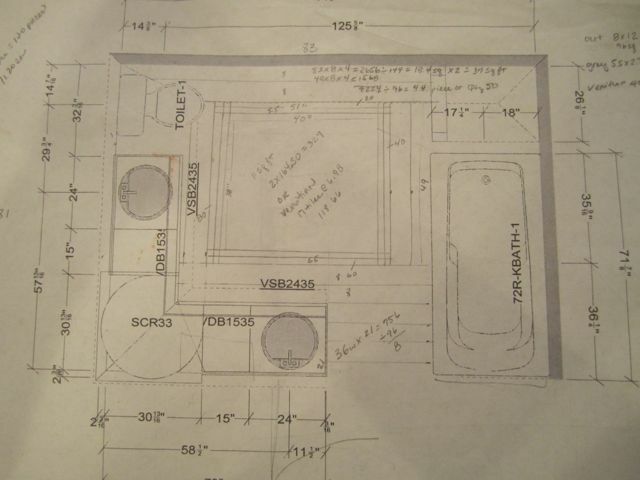 Drawing details can help your contractor understand your desired placement. I originally planned for a three light vanity light, but it looked too small in the space. I later found the five light bath bar at Lowe’s and am so glad I made the change. Our double vanity “before”. Our sinks were side by side and the bathroom was really a narrow L-shaped hallway. The old bathroom had a dated “rustic” feel to it. The floor was carpeted and we only had one towel bar. The view from the master bedroom. 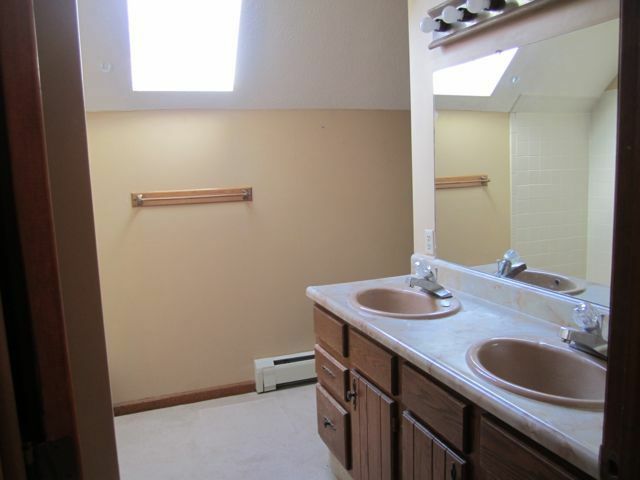 The space was tiny with everything crammed into one side of our L-shaped bathroom. The view from our master was dull. 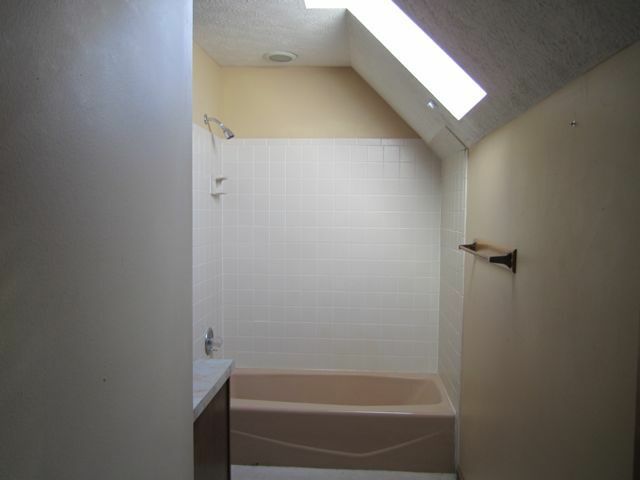 The sloped ceiling meant head room in the shower was cramped. The sky light was a nice feature but the texture was peeling and stained. This is the old closet behind the double vanity that we removed. Taking this out nearly doubled our bathroom space. Dimensions on this closet were 4′ x 5′. Demolition required changing the footprint of the entire bathroom. Our contractor rerouted all the plumbing and electrical. 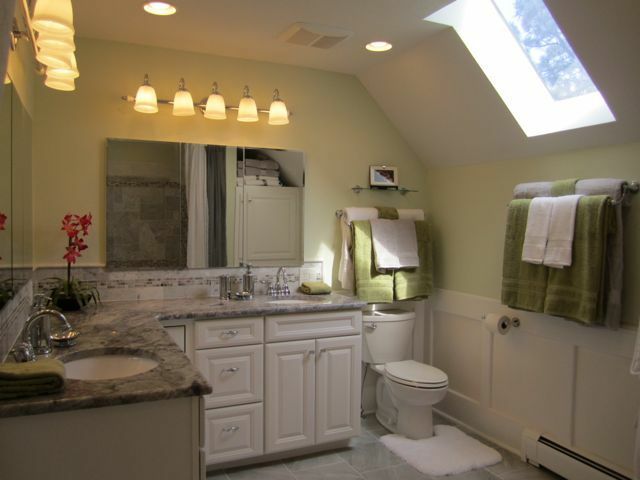 I hope you found some inspiring sources and resources for your bathroom remodel. This change has greatly improved the functionality and value of our home. We’re so glad we’ve completed our renovations! If you have any question about our master bathroom remodel feel free to leave a comment below — I always love hearing from HappyandBlessedHome.com readers! Thanks for being a fan! Do you have a board for home decor or remodeling on Pinterest? Help spread the word and PIN this post on Pinterest!